Experienced in providing expert, fresh new looks for Commercial, Professional, and Residential settings. Ross Upholstery is a local, family business that sees your furniture as more than just a place to sit. With more than 40 years of experience, spanning three generations, Ross Upholstery is committed to bringing your ideas to life. For us, Upholstery is an art and the process of blending creativity and beauty to meet the needs of your business, home, and beyond. Jerry first began in the upholstery business working for his parents as a teenager. After having graduated from Butler University and spending time as a music teacher and music minister, Jerry decided to open Ross Upholstery in 1986. Nearly 30 years later, Jerry has been blessed to be able to complete thousands of projects for his satisfied customers and business partners. Adam is the third generation upholsterer for Ross Upholstery. Following in similar footsteps of his father, Jerry, Adam began learning the art of upholstery and furniture design as teenager. 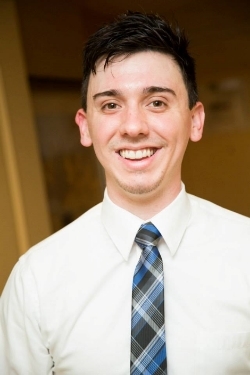 Adam worked for a textile company and in higher education technology after graduating from Butler University, before deciding to join the family business.